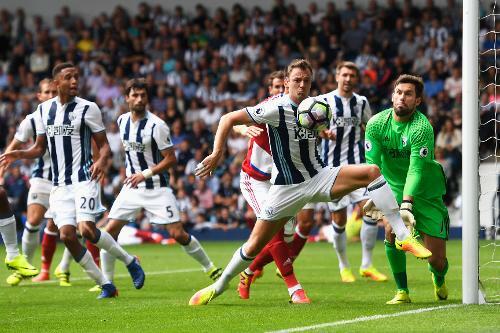 After 90 minutes of nip and tuck football, West Brom and Middlesbrough's efforts weren't rewarded as an often scrappy affair in The Midlands saw each side leave with a single point intact. The hosts' best chance came from Michael Dawson's narrowly wide header from a corner, while Middlesbrough rarely tested Ben Foster but saw Stuani's effort inside the box saved well late on. On a bright day up in the West Midlands, albeit with the odd empty seat in the home section, West Brom with intentions of cooking up an impressive performance - highlighted by a wonderful attacking move that saw Galloway cut back to Fletcher outside the area, who subsequently pinged a ball in James McClean's clutches, however his stabbing effort on the left byline was kept out by a smothering Guzan. In a rather dull affair, chances were few and far between. McClean and Stuani, arguably, operated as each side's best attacking players of the half. Rondon and Negredo - two lone strikers - were isolated as neither team committed too far up the field. That would keep Foster and Guzan equally concealed - yet whenever Middlesbrough attempted to test the hosts' goalie - the resolute defence of West Brom stood firm. Of course, with 10 players locked behind the ball and often including striker Rondon. Negredo couldn't capitalise on Downing's attacking penetration and glimpses of promise, while Rondon failed to catch any contact on Galloway's dangerous cross from the left, despite having his shirt sneakily pulled back in the process. 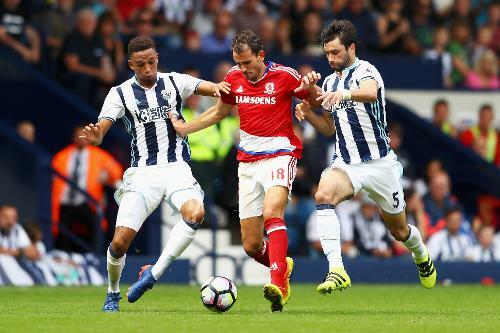 Karanka's men dominated the ball in midfield, but with little concrete chances to test Ben Foster. Stuani, Ramirez and sometimes Negredo knocked on the door but Pulis' solid defensive structure made it tough work to figure out a way through. Half-time observation? A huge sorry to the fans who paid to watch that. Each side struggled to create chances, however Middlesbrough's midfield rock Forshaw controlled the tempo and possession for the large part, subsequent to the away side creating more opportunities as Stuani linked up with Nsue who fed Ramirez, however with lack of support his effort springs wide of the target. In an attempt to add attacking strength, Pulis introduced Jonathan Leko but he was soon taken off due to injury. Saido Berahino was then brought on and, while he improved the pace and penetration, a late winner looked unlikely as Middlesbrough had most incoming attacks covered. Michael Dawson saw his header from a promising corner bounce narrowly wide of the target - in what was perhaps West Brom's best chance of taking the lead. Karanka's men shaded possession, yet lacked end product. Downing and Stuani were the biggest threats but Negredo was never in a position to take Foster out of his comfort zone. Moments after the 70 minute mark, Stuani's effort was then saved by Foster himself after Barragan's weaving run outside the box. As the match opened up, it suited Middlesbrough to a tee. Negredo worked well with teammates, including Downing, who looked a menace but had a shot skim past the post. Subsequently, West Brom finally showed glimpses of what their fans hoped for since the first whistle. Berahino offered a new dimension up front, and his cross was cleared for a corner before a scramble of uncertainty in the Boro box caused some signs of nervousness at the death. It wasn't to be and both sides, to the crowd's discontent, were forced to settle for a rather lackluster draw.